I Found a Wood Blewit! What a treasure to find right here in my own woods. Bluish/lavender in color and very yummy sautéed in butter. But you better know what you are doing if you harvest and eat your own mushrooms because there are some that can kill you! 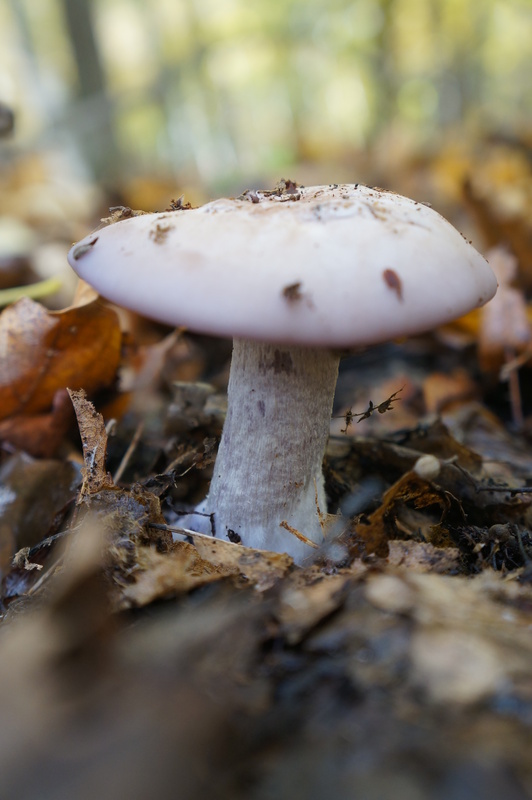 Shirley was excited because we haven’t seen blewits in our woods for about 5 years now. So maybe this is a blewit year! 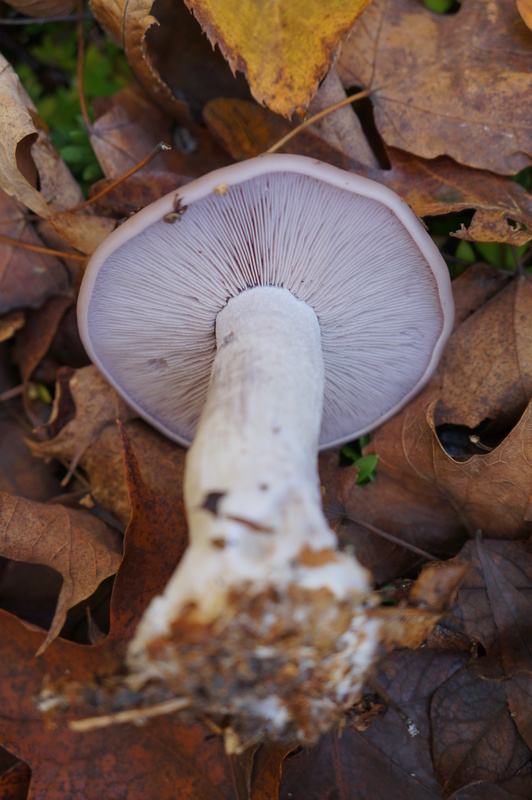 Blewits have a lovely lavender tight gill arrangement on their undersides, a bulbous base, and a yummy flavor. Do not take this information here as any kind of proof that you have a blewit that is safe to eat! Find someone who knows and check with them! Even books and videos are hard to go by. I like the French method where you can take mushrooms in to pharmacies for proper identification before consuming. Can you imagine the liability!? Also, you would have to have lots of people who have this knowledge. In the U.S. I think this is rare, but there are people around if you seek them out! These slices were quite yummy after their stint on the stove. 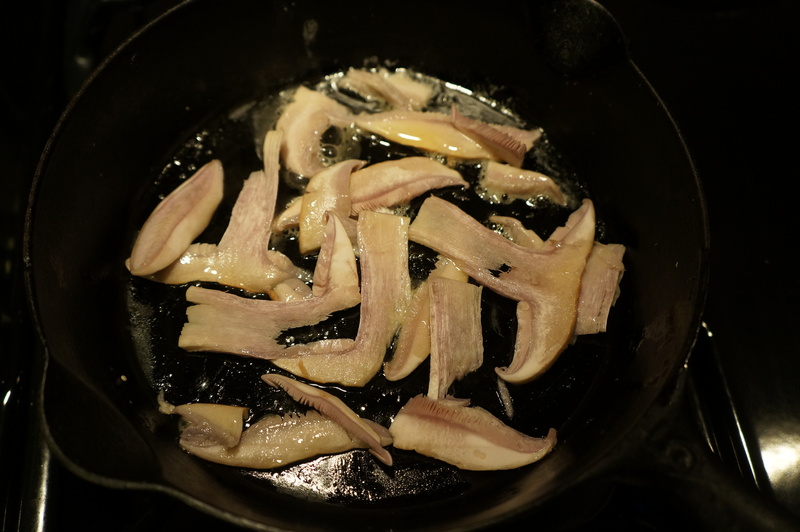 The wood blewit retains its lovely color even after cooking. And they must be thoroughly cooked to be good to eat. You have your own woods. I’m turning green. I do like mushrooms especially field mushrooms . We sometimes have shitakes which are nice. Yep, our house is surrounded by about 2 acres of woods that we own, but joins up with other properties so the woods seems a lot larger than that. I’m so blessed to have a mushroom expert so close by! I love shitakes and I grew them on a log once, but I don’t think they grow here naturally. My goodness, you own 2 acres of land. Yes, you are blessed indeed. I’m now a luminous green. Luminous! I would like to see that!